H.E.I. 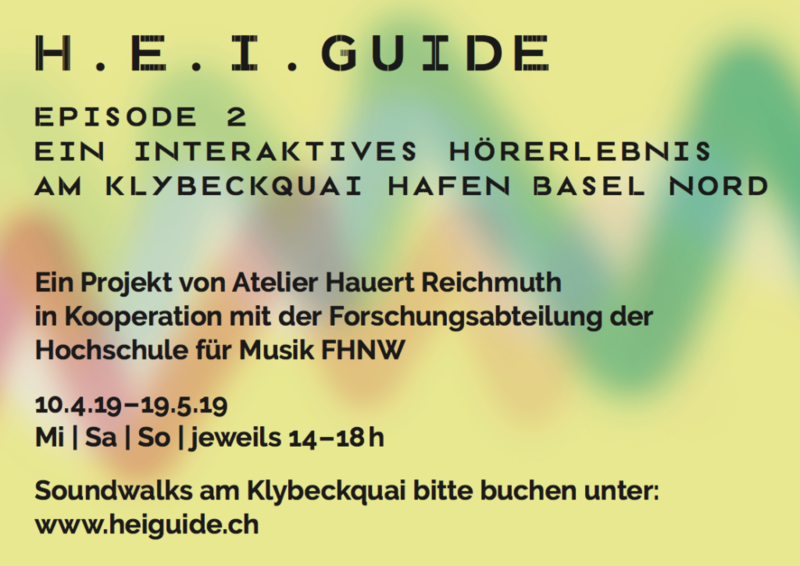 GUIDE is an interactive soundwalk by Atelier Hauert-Reichmuth , which I have been working on last summer. It takes place around Klybeckquai, port of Basel North. I was responsible for sound and interaction design. Equipped with headphones the visitors are sent on a acoustic research trip that oscillates between reality and fiction. The whole area is transformed into a fantastic listening space, filled with real environmental sounds, field-recordings, subtle manipulations and interactive compositions. The system runs on mobile phones, for which Thomas Resch has developed an impressive software based on a game engine principle. It constantly tracks the position of the visitors (by collecting GPS data) and their head orientation through a sensor which is placed on top of the headphones. The head tracking data serves as orientation control for the binaural synthesis of the soundscapes that are played back through the headphones. Like this, the image of the aural scenery triggered by the GPS position data, doesn’t move around with every head tilt, but stays in place – just like natural sound-sources would do – and mixes well with the real sound world coming form the ‘outside’.